UNISON Scotland is calling on Local Government members to REJECT the employers’ latest pay offer in an online ballot running from 16 October to 5pm on 7 November. You can vote from the link on this page. The ballot will also ask you whether you are willing to take industrial action up to and including strike action in pursuit of our full claim. 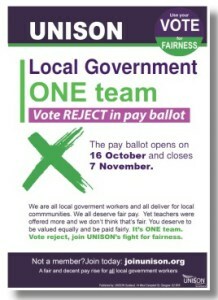 More information available at UNISON Scotland site.